WASHINGTON — An enraged President Donald Trump and a prominent Republican senator who fears the country could be edging toward “chaos” engaged in an intense and vitriolic back-and-forth bashing on social media Sunday, a remarkable airing of their party’s profound rifts. 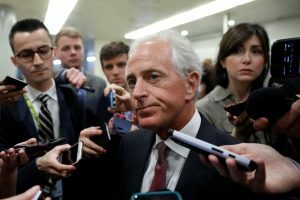 Corker also said his concerns about Trump were shared by nearly every Senate Republican, the paper reported. Was “largely responsible for the horrendous” Iran nuclear deal, which the Democratic Obama administration negotiated and Corker considered badly flawed. The senator also tried to require that President Barack Obama submit the accord to Congress for approval. “Begged” for Trump’s endorsement in his 2018 re-election, then opted against seeking a third term when Trump declined, showing the senator “didn’t have the guts to run.” The Associated Press reported that Trump, in a private meeting in September, had urged Corker to run. Corker’s chief of staff, Todd Womack, said Sunday that Trump called Corker last Monday to ask that he reconsider his decision to leave the Senate. Trump “reaffirmed that he would have endorsed him, as he has said many times,” the aide said. Wanted to be secretary of state, and “I said ‘NO THANKS,'” said Trump, who picked Exxon Mobil’s Rex Tillerson for that Cabinet post. Corker, the Senate Foreign Relations Committee chairman, was mentioned as a possible pick after the election. Corker’s comments drew a rebuke Monday from White House Counselor Kellyanne Conway, who said on “Fox & Friends” that she finds “tweets like this to be incredibly irresponsible.” She added that the president’s door is always open to speak with lawmakers privately. NewsHour Weekend Special Correspondent Jeff Greenfield joins Hari Sreenivasan from Santa Barbara, California, to discuss the internal party battles with the GOP. Corker, 65, announced last month that his second, six-year term would be his last. Trump fired back, tweeting that Corker’s comments were strange “considering that he is constantly asking me whether or not he should run again in ’18.